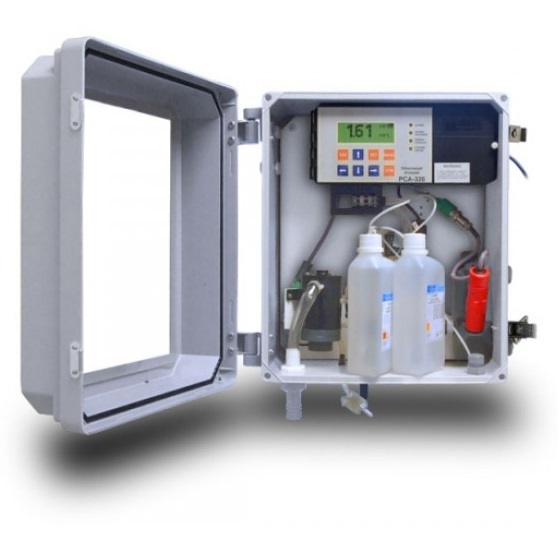 The HANNA PCA 300 series models are chlorine, bromine or iodine and pH, ORP and temperature process analyzers which continuously monitor a sample stream and control the dosing to adjust the chlorine, bromine or iodine content and pH. From drinking and wastewater treatment to the pool and spa sanitation, the monitoring of chlorine, bromine or iodine levels has an important bearing on public health as well as ROI and efficiency for heating system and industrial applications. In the DPD Colorimetric method, N, N-Diethyl-p-phenylene-Diamine indicator and a buffer are mixed with the sample. Free available chlorine oxidizes the DPD indicator reagent at a pH between 6.3 and 6.6 to form a magenta colored compound. The intensity of the resulting color is proportional to the concentration of chlorine in the sample. The purpose of the buffer solution is to maintain the proper pH. In total chlorine measurement (free available chlorine plus combined chloramines), potassium iodide is added. The chloramines in the sample cause the iodide ions to become iodine which reacts with free chlorine to oxidize the DPD indicator. A pH of 5.1 is required for this reaction. Thus total chlorine measurements require a different buffer solution containing potassium iodide. Once the chemical reaction is completed, the optical signal at 555 nm is compared to the signal measured through the sample before the reagents were added. From these measurements chlorine concentration is calculated and shown on the display. Indicator and buffer reagent bottles are placed directly into the instrument case. With a sampling period of 5 minutes, reagents need only to be replenished about once a month. Since chlorine, bromine and iodine effectiveness is closely tied with pH levels, HANNA has designed our new analyzers PCA 32X and PCA 33X with pH control and temperature and pH control, ORP monitoring and temperature respectively. PCA 32X and PCA 33X use the HI 1005 pH probe to continuously measure the pH of the sample stream in the range of 0 to 14 pH. The sample temperature is measured in the 5 to 75°C range. pH and temperature are displayed on the front panel, and the pH value is temperature compensated. PCA 33X uses the HI 2008 platinum ORP electrode to continuously measure the sample ORP value. The pH/temperature combined sensor and the ORP sensor are placed inside the case, directly in the sample stream. The PCA has a control time cycle that can be set by the user according with the dimensions of the controlled system. The control process, dosing commands and alarms can be performed according to this time cycle. The range of cycle timing is from 3 to 90 minutes. Four chlorine/bromine/iodine level set points can be adjusted by the operator: a proportional dosing set point, two alarm set points and a minimum level for dosing. The proportional dosing factor (1/Δ) is user selectable with a delta between 0.1 and 2 pH. Chlorine/ bromine/iodine dosing system controls a SPST relay. Each alarm can be enabled or disabled. Three pH level set points can be adjusted by the operator: a control set point and two alarm set points. The pH control mode is user selectable; on/off or proportional dosing. The proportional dosing factor (1/Δ) is user selectable with a delta between 0.1 and 2 pH. The on/off dosing hysteresis is user selectable between 0.05 and 2.00 pH. The pH dosing system controls a SPST relay. Each pH, ORP and temperature alarm can be enabled or disabled, and two alarm levels can be set by the user also for temperature and ORP. Alarm condition controls a SPDT relay. The system error feature activates a relay to signal the need for operator intervention. System error condition controls a SPST relay. Two current outputs of 4-20 mA or 0-20 mA are available to drive external devices such as chart recorders. The analyzer can drive two dosing pumps through the 4-20 mA outputs for chloride and acid/alkali dosing. The analog output is fully programmable and can be proportional with chlorine concentration, pH, ORP or temperature value. The limits of the analog output is selectable for each parameter. The analyzers can store up to 3500 readings (at least 7 days at 3 minutes sampling interval), that can be available for consulting or downloading. Logged records contain the time stamp, full information about the parameter values and the alarm status at the time. Through the system, users have the ability to enable or disable the low and high level of alarms for all parameters. The system also offers overdosing protection that generates an alarm if something within the system is not working properly. The system will stop processes until the error is corrected by the user. Time is displayed on the main panel and time related reminders are available for “old calibration”, “reagent expired”, and “SIM expired”. All these warnings are generated based on user settings. These controllers are offered in an easy to access, wall mounted casing that offers outstanding chemical, mechanical and temperature resistance. HI 70450 Indicator solution for PCA series. HI 70451 Buffer solution for PCA series.